Schools bring in many motivational speakers to encourage students to stand up to bullies, drugs, alcohol and tobacco, but every few deal with life-threatening injuries. 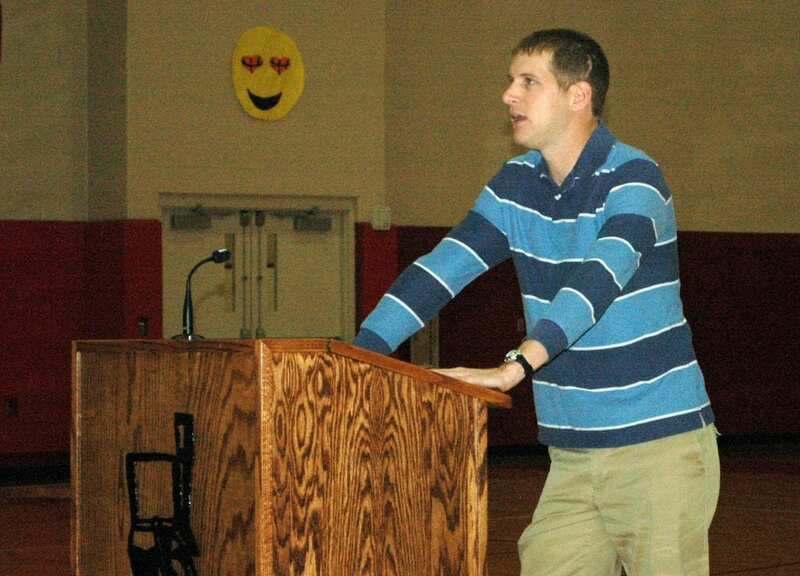 For the students at Hilltop High School (grades 7-12), their guest speaker shared his tale of being severely injured in a bus crash as a member of the Bluffton University baseball team during Spring Break in Atlanta, Georgia, March 2, 2007. According to Wikipedia, at about 5:38 am EST, while operating the bus southbound in a left-hand high-occupancy vehicle lane of I-75 in the Atlanta metropolitan area, the driver accidentally entered a left exit ramp, which ended abruptly at an elevated T-junction marked by a stop sign. When it reached the top of the ramp and the stop sign, the bus was traveling at highway speed. The driver lost control of the bus, which slid sideways into a concrete bridge wall and chain-link security fence, then fell 19 feet, landing on its left side across the interstate highway below. Twenty-nine passengers survived the crash, while seven occupants were killed. Tim Berta said he was thrown out of the bus 20-30 feet and landed on pavement. All his ribs were cracked as were two of his vertebrae. For all intents and purposes, he was dead. But since he was young, the EMTs sent him to a hospital. “That’s the only reason they sent me,” Berta said. From there, Berta recalled having to be told about the accident as he still has no memory of the incident. He talked about his long road to recovery. His spleen had to be removed and his skull fractured. “Their assessment was that I was dead,” Berta said. Teamwork was a big reason for him to survive. Once it was decided he was worthy of further medical attention, there was the matter of transporting him quickly to the hospital during morning rush hour. “It took teamwork to get me into one of the best hospitals in the United States in four minutes in downtown Atlanta,” Berta said. “I was at the number one trauma center within minutes of the biggest tragedy of my life. The team theme continued with the doctors who performed multiple surgeries and the nurses who went above and beyond for him. He told of a nurse who would come in on their days off and mop his room. There were baseball families in Atlanta who cooked meals for Berta’s family while they waited in the hospital. The staff made a room especially for them. His family was team in helping him recover when he finally went home and to rehab. Berta broke the ice with his audience by having everyone move the edge of their seats and then and stand and clap loudly. Why? “So, I can tell people I had the audience on the edge of their seats and got a standing ovation,” Berta said to laughter. Berta’s talk was a two-parter with the final segment at a local church where Berta shared the spiritual aspects of his recovery. Be the first to comment on "Teams Credited For Saving Bluffton Bus Crash Survivor"